﻿ VIDEO: Aprilia RSV4 Factory APRC SE v some Datsun – are bike firms growing their balls back? 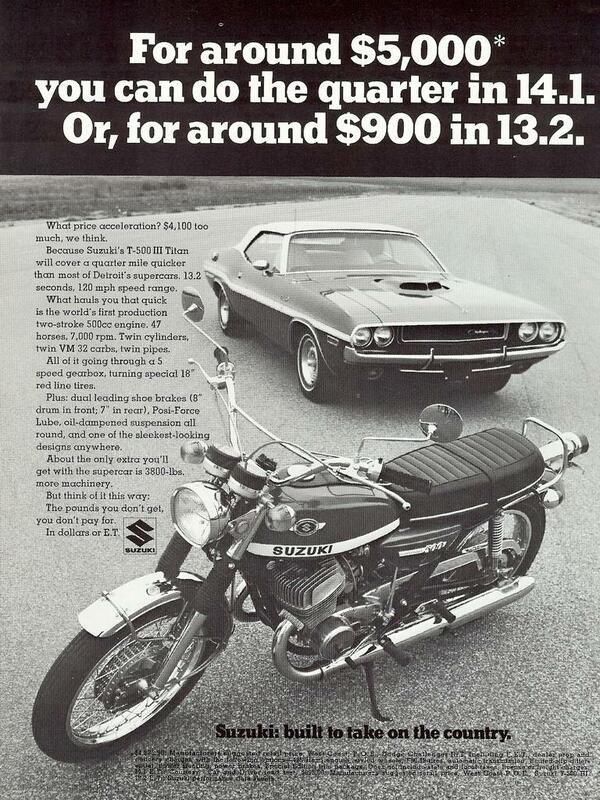 Look at bike ads from decades passed and you come away thinking some manufacturers today aren’t fighting hard enough for the customers they have. Most of all, why did they ever decide to let cars get away with selling themselves as fast or exciting or reasonably priced? So we're pleased to see a tentative return to the glory days with this new ad from Aprilia. Okay so it's their US distributor grabbing its cojones, not Aprilia itself, and the ad looks like a Top Gear skit awaiting the twatty voiceover. But it reaches for a vital, inexplicably neglected weapon in the bike promoter's armoury: in terms of bang for buck, cars are party poppers and bikes are nukes. Fact. The end. QED. Dammit, if they'd riffed on this theme with every bike since the good old days (see below) who's to say we wouldn't have turned back the tide of car dominance by now? People aren’t born car buyers - they fall victim to the pro-car propaganda that’s laid on like fluoridated water. Cars aren’t ‘good’, they insulate you from the need to care about your safety or other people’s, they needlessly consume resources and they’re used for ram-raiding. Manufacturers: you shouldn’t have let them get away with being the goodies for so long, let alone keep it secret that a £5000 Hornet out-drags a £70,000 Porsche 911.